Cornhusker Auto Center in Norfolk, NE, also serving Columbus, NE, Fremont, NE, Grand Island, NE, Kearney, NE, and Sioux City, IA and Yankton, SD is proud to be an automotive leader in our area. Since opening our doors, Cornhusker Auto Center has kept a firm commitment to our customers. We offer a wide selection of vehicles and hope to make the car buying process as quick and hassle free as possible. We are a best price car dealer, where our best price is posted on every vehicle and our website. 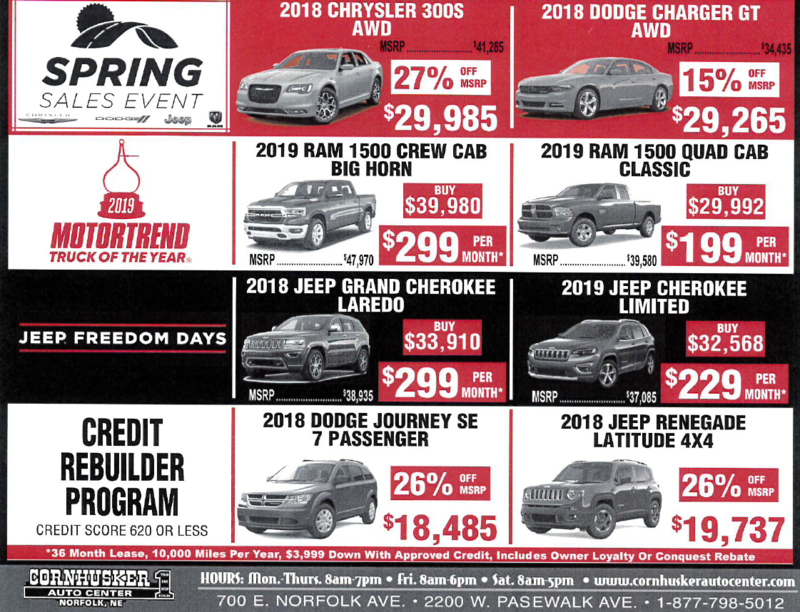 If you would like financing options and you are in the market to purchase or lease a new Chrysler, Dodge, Jeep, Ram or used car or truck, we will provide assistance to help you find auto financing options that fit your needs. Whether you have bad credit, no credit or are a first time car buyer, you can trust that Cornhusker Auto Center will get you into the car or truck you choose with professionalism and attention to your car needs. Cornhusker Auto Center of Norfolk has an experienced and reliable Service and Parts departments that are open extra hours to help fit our customers’ hectic schedules, and as always, Cornhusker Auto Center offers competitive pricing for your automotive maintenance needs. Customer satisfaction is our highest priority, and our staff is committed to achieving this goal in every aspect of our business. Please feel free to reach us at (402) 371-3765 if you have any questions or comments.